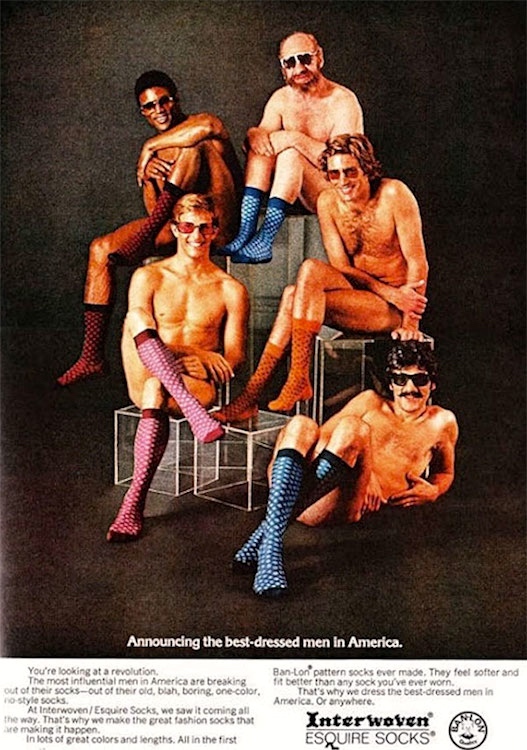 Earlier on this blog: from 11/6/16 “Wearing the 1970s”, with a set of entertaining ads and links to other postings. This is (I think) the weirdest of the four. 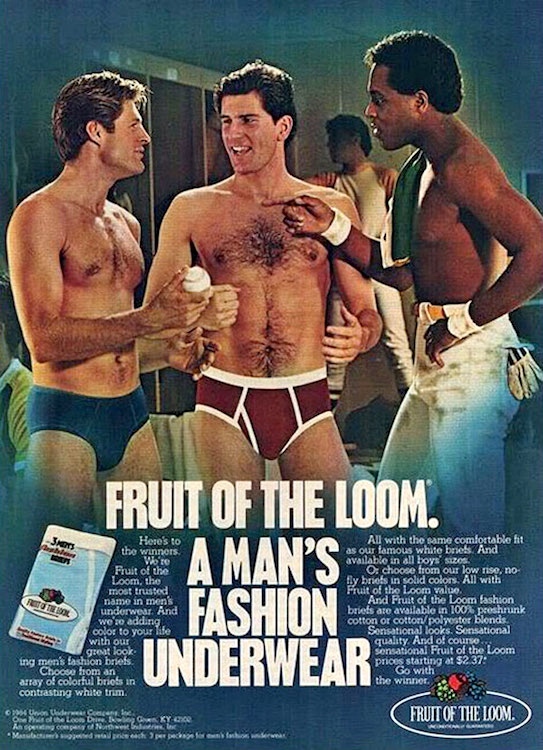 The text appears to be a play on get into s.o.’s pants, and it’s easy to read the visual as a sexual interaction between two men. But then there are two extra, smaller, legs in the photo, one of them tied to Joe’s right leg, as in a three-legged race. My conceit is that these extra legs belong to elves. I have no idea what the ad agency had in mind. The notable element here is the glove in the right-hand guy’s left back pocket. Marking him as a top? Especially worth notice: the moose-knuckle fig leaf. Everybody with legs positioned so as to conceal their packages. Note the seductive facial expression and inviting open mouth. One on one between the model and you. This entry was posted on April 4, 2018 at 5:22 am and is filed under Captions, Fashion, Language in advertising, Language play, Phallicity, Signs and symbols, Underwear. You can follow any responses to this entry through the RSS 2.0 feed. You can leave a response, or trackback from your own site.